The Episode starts with Veer being on the way with Thakur. Thakur signs his driver. The driver acts that car has broken down. Thakur makes a plan to kill Veer. The smoke fills inside the car. Veer shouts to Thakur that smoke is increasing inside the car. Thakur laughs, while Veer gets locked inside the car. Veer hits the window. Some men come there and attack Thakur. Thakur asks who are you all. The robbers ask him to remove his gold chain and handover all the cash. He hits Thakur. Veer comes out of the car and attacks the robbers. He says I m Kaal Bhairav, you want to rob and kill people, I will punish you today, I told you no one will do wrong work in Kanakgadh. The man asks will you punish me. The man hits Thakur. Thakur falls down. The man says we will beat you as well. Veer fights with the goons. Veer saves Thakur. He forgets everything and asks Thakur about it. Thakur asks don’t you remember anything. Veer says no, I was calling you and then I fainted, when I got conscious, I m seeing this. Thakur says robbers had come, they have hit me and driver, don’t know how they fainted. Veer says I think Lord has done this, whenever anyone does wrong here, Lord punishes them. Thakur asks driver to take them to Kanakgadh. Veer says we will give the robbers to police. He takes the phone to call police. Thakur worries seeing him. Veer calls police station. Kunika says Kaal Bhairav will come and punish the sinners. Veer gets Thakur home. Archie hugs Veer. She says if anything happened to you, then…. Veer says whatever is written in my fate will happen, Kaal Bhairav is with us, the robbers aren’t fine, we got robbers arrested. He introduces Thakur and says Sarpanch has seen the miracle, I had fainted. Thakur says yes, whatever happened today, Lord has saved us. Archie says what would I do if anything happened to you. Veer says I m fine, he saved my life. He asks Akshay to arrange a doctor for Thakur. He asks Thakur to stay with them for a day. Thakur says I have imp work in village, Akshay said your life is in danger, so I had come to drop you, I will go. Akshay says your car will get repaired in few hours, stay back. Thakur agrees. Abhiram says Veer broke your hand, but I have caught him first, none knows about the idol. Neeraj says Lord will punish you. Abhiram calls Thakur. He says I have to go there and look for myself, what happened with Veer. He gets ready as Neeraj. Thakur says Abhiram shouldn’t come here, else Veer can punish him, I have to stop him. Baba says we have to place Utsav idol in temple, its imp to save the idol having Kaal Bhairav’s powers, it will be purified by Lali’s heir first. Veer says we don’t know where is Neeraj, we don’t know about Lali’s heir. Baba says Lali’s heir is alive, you have to find her. He guides them to get Utsav idol. Thakur looks on. He meets Neeraj and asks what are you doing here. Abhiram says its me, how come you are here. Thakur asks why did you come here. Abhiram says this was our plan, that you will kill Veer and then I will kill everyone. Thakur says no, Veer is someone else. He asks Abhiram to go fast and not tell anyone about Neeraj. Akshay catches Neeraj. Rajmata asks Veer to talk to Neeraj calmly. Veer says he did a sin by stealing the idol. Veer takes Abhiram with him and shuts the door. Thakur worries and asks Akshay to stop Veer. Akshay says we can’t help him. Thakur thinks you all don’t know how Veer talks, what will he do with my son. Veer beats Abhiram. Akshay stops Thakur. Veer gets Abhiram out and says he told me about Utsav idol, he was guided by Lord, we all will go to get the idol. Thakur thinks what did Abhiram do, before they reach there, I have to be there. They hear some sounds of animals. They see a warning message that Archie has done a crime. Archie asks what crime did I do. 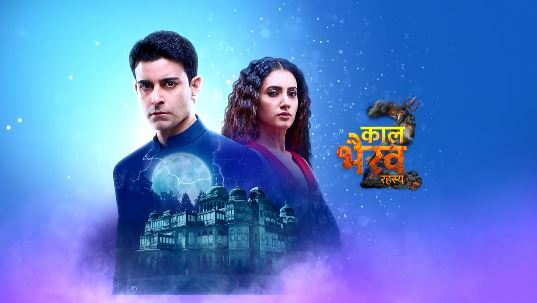 The post Kaal Bhairav Rahasya 2 28th February 2019 Written Episode Update: Veer beats Abhiram appeared first on Telly Updates.